I set out to write a straightforward narrative of the second half of our journey in this post. 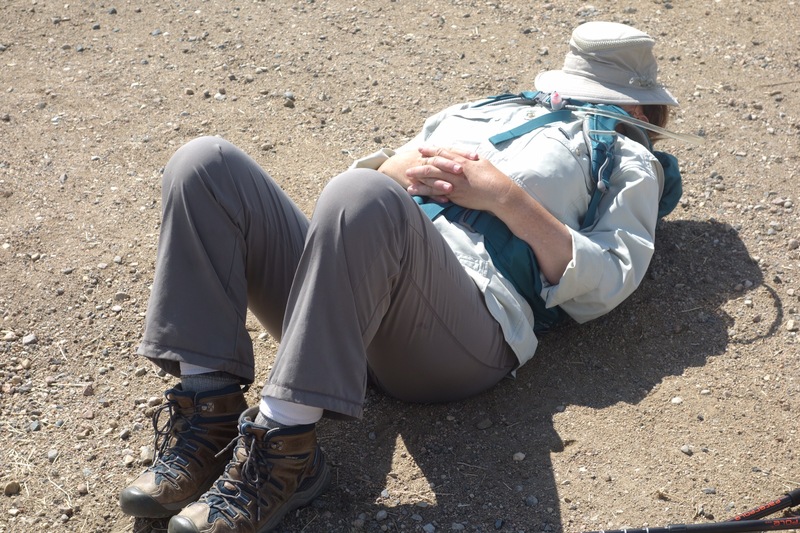 Of course, the time to write that kind of narrative would’ve been during the walk, if I’d had the time and the cell signal and the battery power to write a blog post every day, which I didn’t. 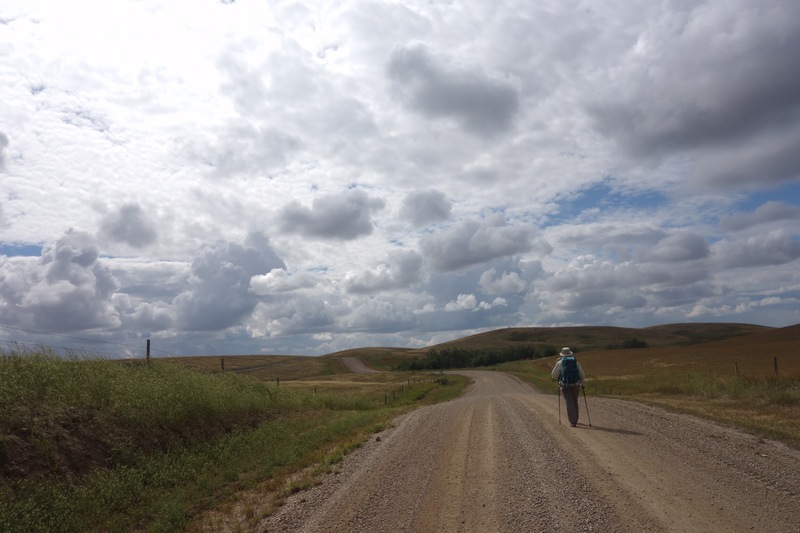 So instead, while the photos in this post are in chronological order, the text is more reflective, a series of musings on what I learned while walking from Swift Current to Battleford. 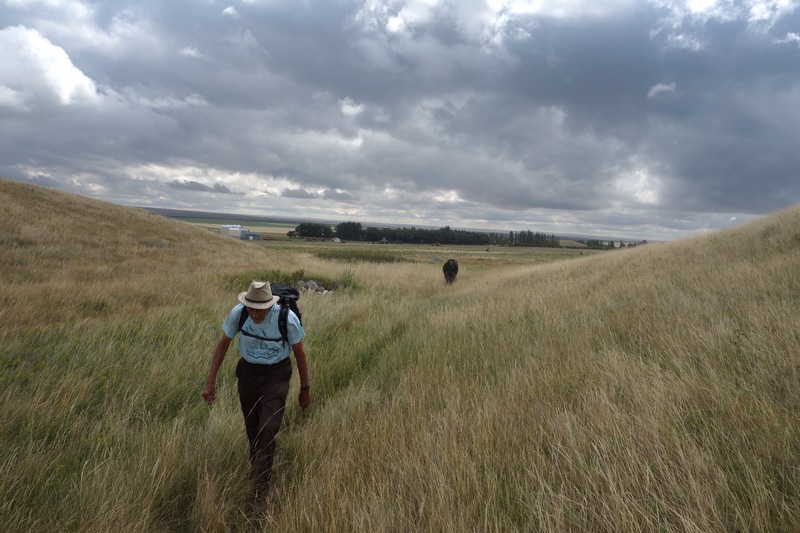 We arrived at Fort Battleford on Sunday afternoon after walking some 350 kilometres. At Battleford, we were met by two very different groups of people: folks from the local historical society, on one hand, and Cree drummers, singers, and dancers, on the other. It was as if we were seeing the history of the area, and by extension the history of western Canada, from two very different perspectives. And not just history, either: we were also seeing two different versions of our present and future, too. 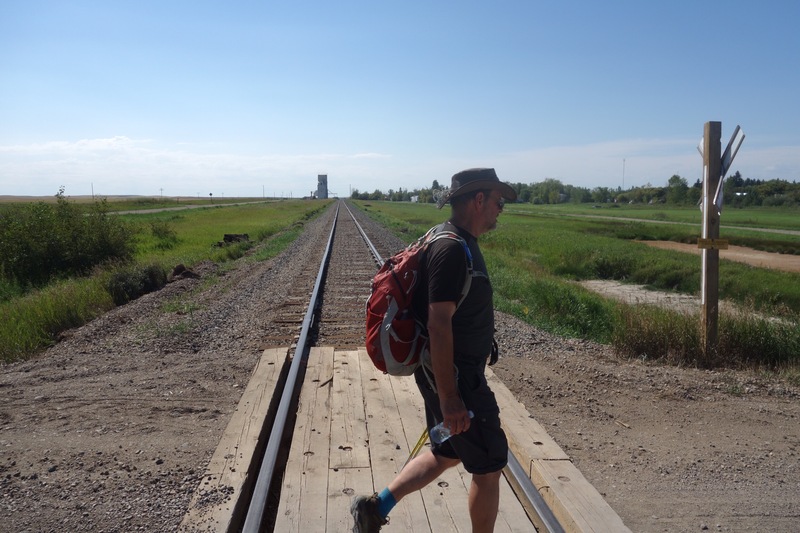 As we got closer to Battleford, the conflict between those different visions of our past and present and future seemed to become more stark. 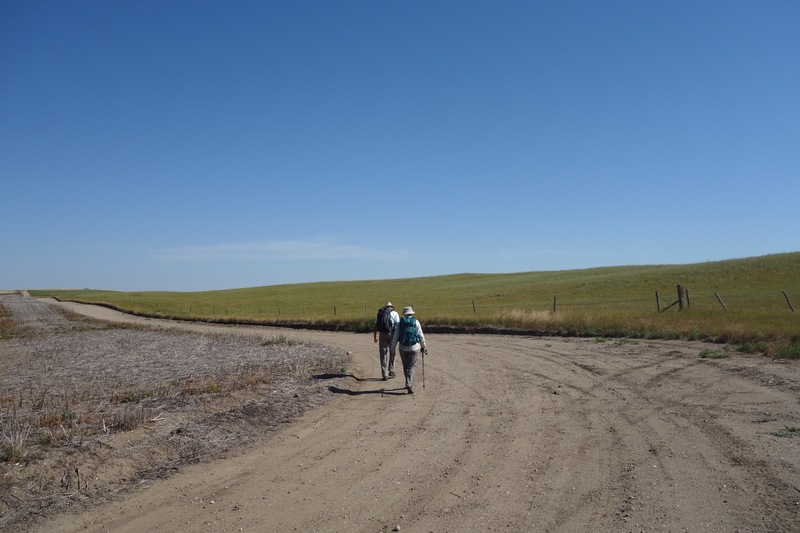 After Hugh’s presentation on the Battleford Trail at Cando, for example, a friendly woman told us how frightened she’d been when she saw us walking past her farm. Strangers had recently come into her farmyard, she said, and she’d wondered who we might be and what we were up to. That remark reminded me of the shooting of Colten Boushie last summer–another stranger who wandered into a farmyard–and of the fact that my white skin would likely protect me if I entered a farmer’s yard uninvited. What’s behind the fear she described? Who was she describing with that word “stranger”? 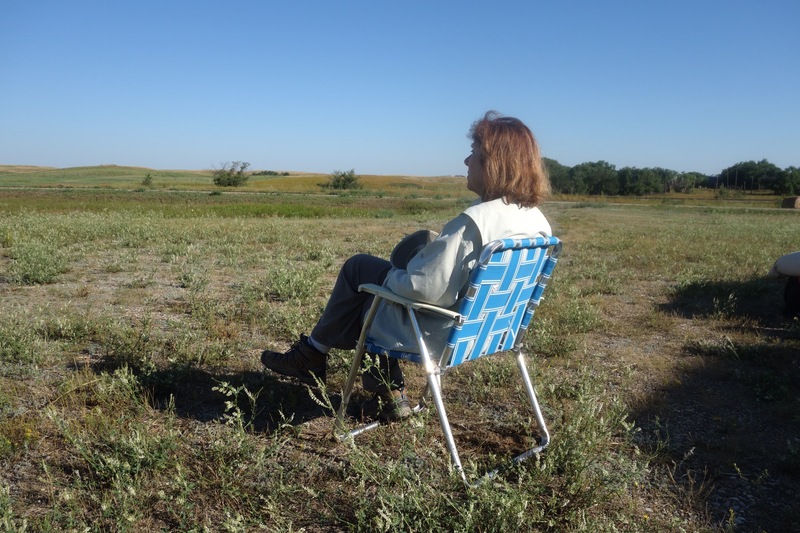 Is her fear related to the proliferation of signs reading “No Trespassing” as we got closer to Battleford? As an outsider to that part of Saskatchewan, I couldn’t help feeling that we were seeing the outlines of a deep racial or cultural divide. “There are 13 reserves around the Battlefords,” one fellow reminded us–a suggestion, perhaps, that the settlers in the area feel surrounded. 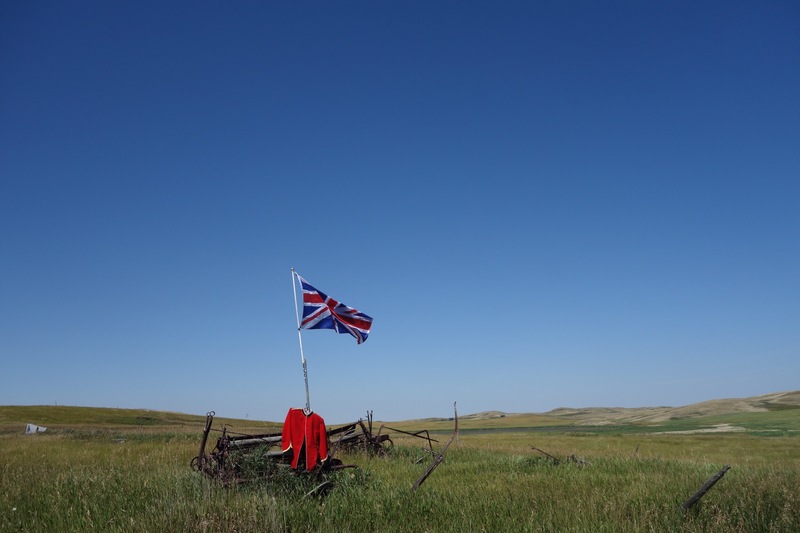 Of course, it was the federal government’s decision after Treaty Six was signed in 1876 to force chiefs who would have preferred reserves somewhere else to settle around the Battlefords. The federal government’s subsequent behaviour led to the tensions that erupted in 1885, despite the efforts of chiefs like Poundmaker and Big Bear to prevent violence. And the town of Battleford was one of the centres of the events of 1885. So much of the history of Battleford looks back to 1885. I suppose that’s not surprising: it was an important event, one of the few times that Indigenous people and the Canadian state engaged in open warfare. 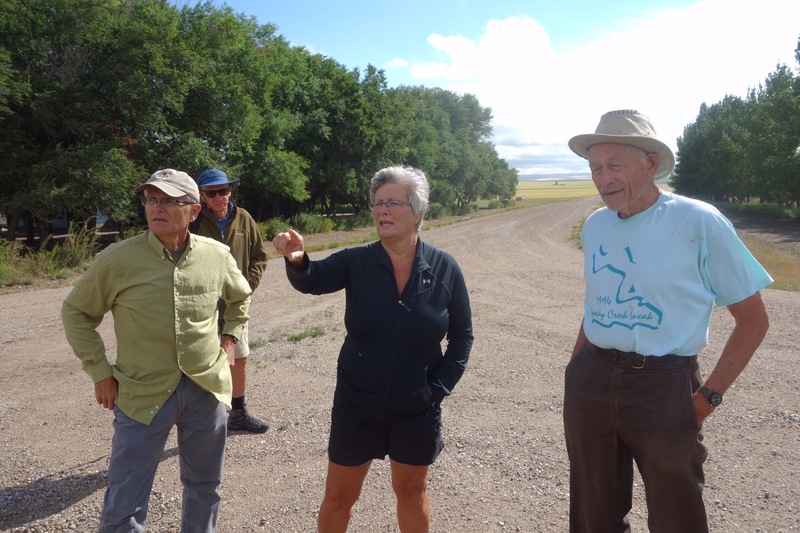 The fellows from the historical society showed us the land titles building, the first brick building constructed in Saskatchewan and the only structure from the original town of Battleford that still stands. Much of the town was burned in 1885, and as a result it was moved across the river, closer to the fort. More recently, vandals burned down the few remaining buildings, including the former Government House. After the capital of the Northwest Territories was moved to Regina in 1883, Government House became an Indian Industrial School, and many former residential schools have burned down, by accident or on purpose. That wasn’t the only way Government House was used–after the Industrial School closed in 1914, it was a Seventh-Day Adventist boarding school, and in the 1930s it became a Catholic seminary–but as I looked at the foundations of the building, it was the Indian Industrial School I was thinking about, and its nearby graveyard, where some 50 students at that school are buried. “Students got a top-notch education at the residential school here,” one of the local historians told us, and I had a hard time squaring that description with the school’s deliberately genocidal purpose–and those graves. I walked away and left some tobacco at the bottom of the building’s chimney in honour of the children who’d been incarcerated inside those walls. I would’ve left it at the cemetery, but that’s on private land and we weren’t allowed to go there. The fellows from the historical society were primarily interested in the settler’s perspective on the 1885 Rebellion, or Resistance–the different connotations of those words are signs of our continuing divisions–and the military details of that conflict, rather than in its causes or what it might tell us about Indigenous-settler relations, then and now. They pointed out chips in the land titles building’s bricks that were, they said, caused by rifle fire from First Nations warriors. Later, they showed us trenches on the other side of the Battle River where Colonel Otter’s Gatling gun and riflemen had been positioned. 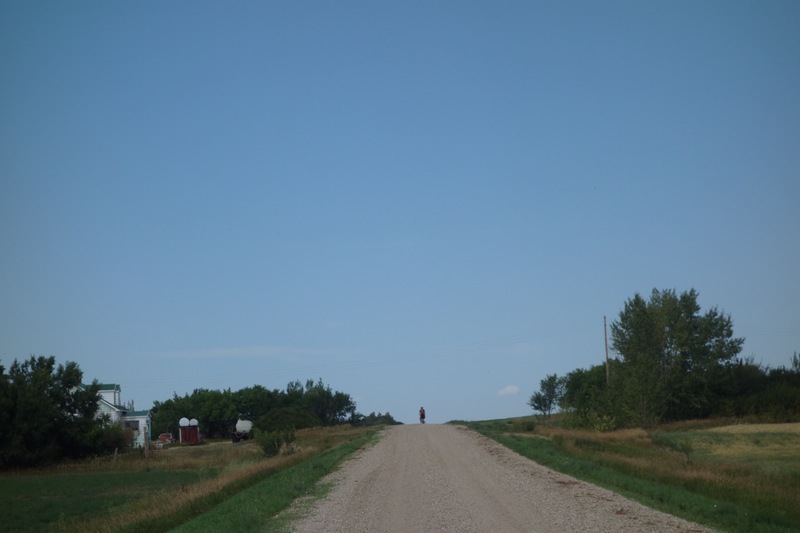 Then we walked up Colonel Otter Drive to Fort Battleford, where settlers took refuge in 1885. There we were treated to a demonstration of Plains Cree dancing, singing, and drumming. We were told how the dances and songs have developed over time, where they came from, and what they mean. There was a sense of a living and changing tradition, and an openness to the future that was absent in the descriptions of the past we’d heard earlier that morning. 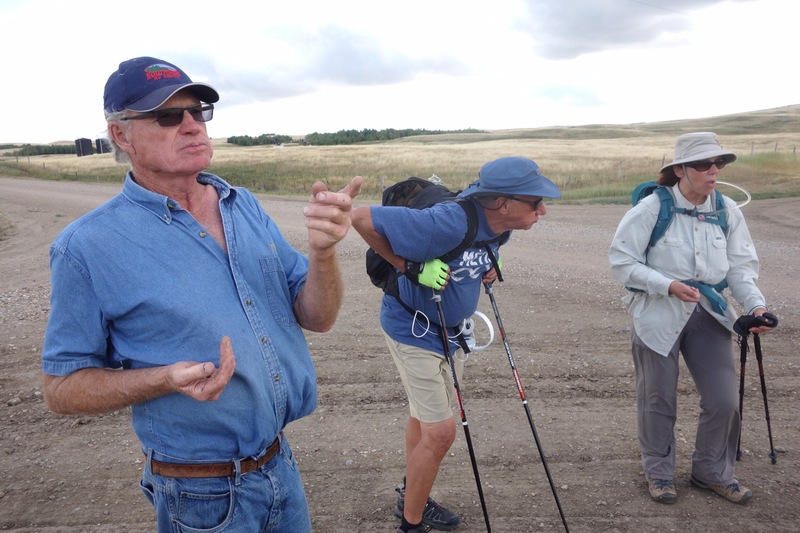 Then Hugh and Rick spoke about the walk, about what we’d tried to accomplish, about what reconciliation between these very different perspectives on our past and our future might look like. Afterwards, we began to say goodbye to each other. We’d been strangers to each other when we met in Swift Current 19 days before, but we’d become a little community as we walked together, and it was sad to see that community break apart. Perhaps the settlers’ focus on the past isn’t surprising. 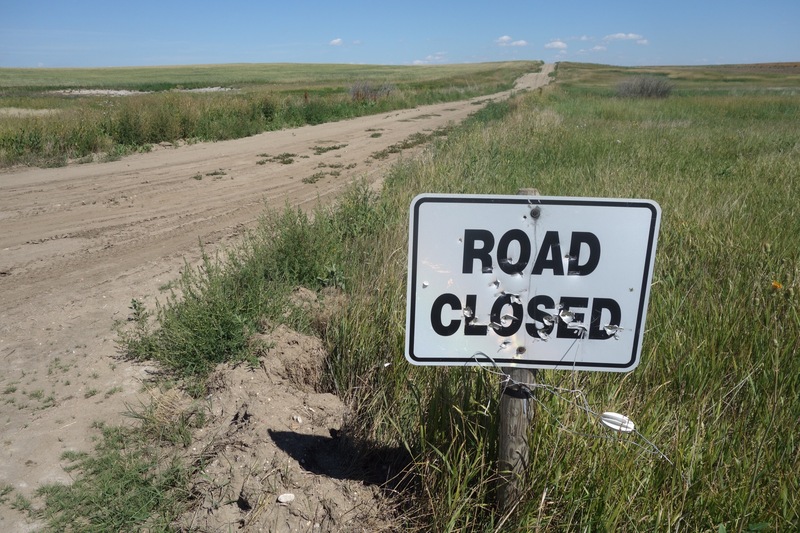 After all, rural Saskatchewan’s best days might’ve been some time before the disaster of the 1930s, which led to a process of depopulation and abandonment that appears to be accelerating. We passed many cairns and signs commemorating towns or schools or post offices that had disappeared years before. We stayed in ghost towns and abandoned farmyards and in communities that were struggling to survive. There’s no surprise in any of this, of course. Given high costs and tight margins, the only way to survive in agriculture is to operate the biggest farm you possibly can, and the fewer farmers there are, the harder it is for villages and towns to survive. And most of the communities we visited lost their elevators and rail lines decades ago, when the grain handling industry shifted to bigger inland terminals. When that happened, those communities also lost their economic purpose. Ever since this land was pulled into the global capitalist system, it has seen wave after wave of rapid change: the fur trade, the extirpation of the buffalo and the destruction of the grassland ecosystem, the forced relocation of First Nations people onto reserves, the development of homesteads and towns and grain elevators and rail lines and their subsequent abandonment. The signs of that abandonment, the decaying buildings and empty farmyards and struggling towns, create a pervasive sense of melancholy. 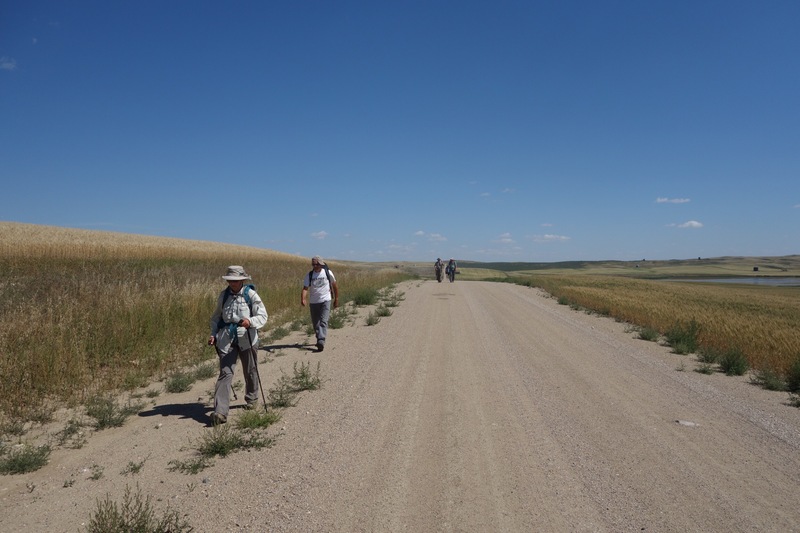 The landscape we walked through was spectacular–huge fields of barley and wheat and canola beneath incredible skies–but at the same time it’s an industrialized landscape. Nature has been pushed to the margins, for the most part, to road allowances and ditches and occasional patches of native grassland. That doesn’t mean nature isn’t present. Badgers and skunks crossed the road in front of me. Hawks kept us under surveillance, suggesting there must be mice and voles and gophers, too. We saw lots of deer and antelope, and listened to the songs of coyotes every night. But it does mean that the landscape is devoted to a single purpose: producing food. Sometimes that means the road allowances and ditches disappear under cultivated fields. And it almost always means that the fields have been treated pesticides and herbicides and desiccants–as we walked, we saw crop-dusters flying overhead and spraying rigs in the fields, looking like huge, ungainly insects. Someone must be making money from all this activity, but it isn’t the farmers. I remember Harold asking one fellow who’d stopped to chat with us about the yield he was getting from his fields of peas. “Oh, maybe 20 or 30 bushels an acre,” he replied. “Well, that’s enough to get your inputs back,” Harold said. Whether that was encouragement or commiseration, I wasn’t sure, but one thing was clear: breaking even is sometimes all you can expect when you’re a farmer in this place. It’s a hard job, one I could never do. I just don’t have the necessary skills, or the fortitude and optimism that’s required. 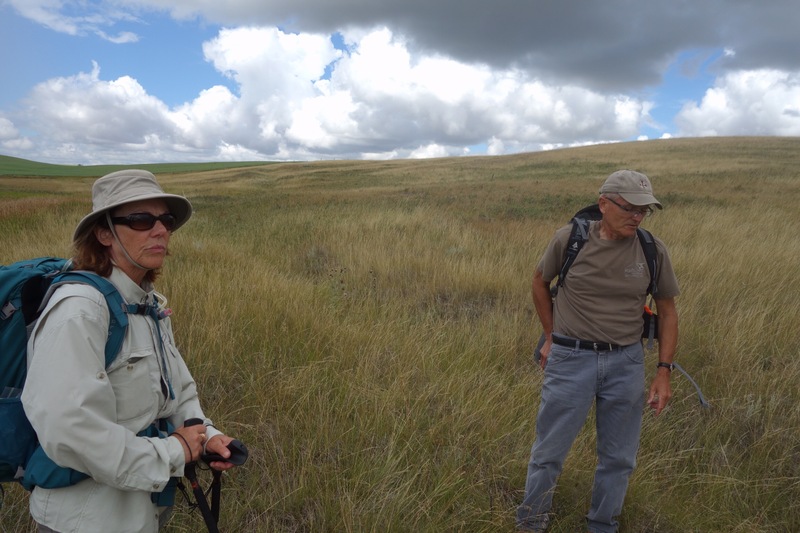 Otter Springs, in the Bad Hills, had been one of the stops on the Swift Current to Battleford Trail. A roofed dugout there had accommodated passengers on the stage coach. It was comfortable enough, apparently, as long as you didn’t mind sharing your bed with a host of mice. The place got its name because of the fresh water that flows out of a spring in a coulee. There’s a wooden well there, but we tasted the water straight from the spring. I was apprehensive about doing that, because of the cattle wandering around the pasture, but the water tasted sweet and clean. We were told that Indigenous people sometimes conduct ceremonies at the springs, and in such a dry land, it’s not surprising that fresh water would be considered sacred. 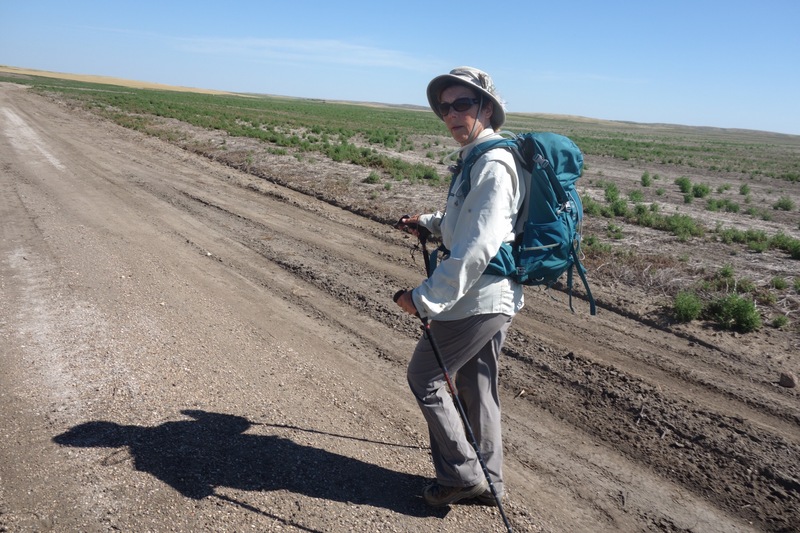 After all, the water in most of the sloughs we passed would be salty and undrinkable, even without the addition of chemical runoff from the surrounding fields. Water was a constant concern on the walk. In some places, there was no water available, and we had to rely on the water we were carrying in our support vehicles. In other places, the water wasn’t fit for consumption: signs over the sinks at the community hall in Cando warned us to use hand sanitizer after washing our hands. But while we had enough water for cooking and drinking, we rarely had enough to wash ourselves or our clothes. When we decided to stay in hotels–at Kyle, Elrose, and Biggar–it was primarily for the luxury of hot running water–and because we needed showers. Badly. Even though we needed those showers, the people we met along the way were always friendly. The people from the historical society in Battleford bought us coffee and doughnuts and sandwiches. 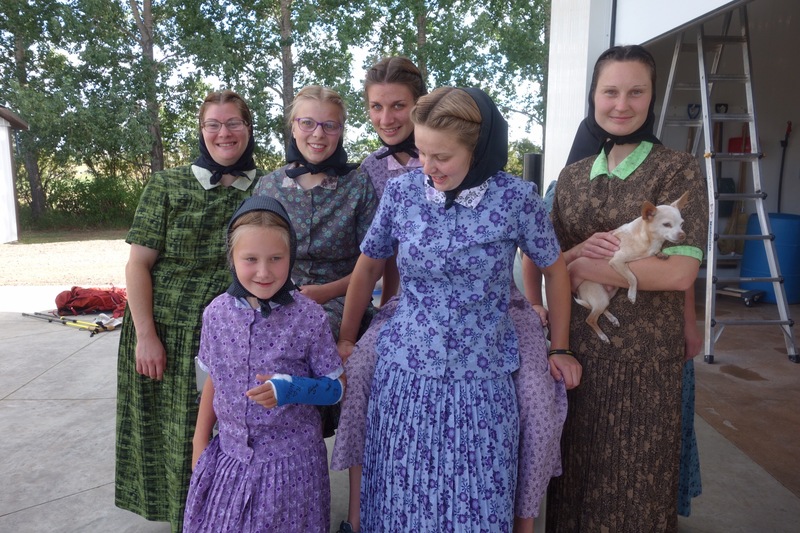 As we passed a Hutterite colony, the women came out to greet us and give us cucumbers and carrots from their garden, and cinnamon buns from their kitchen. That same rainy day, we were invited into a farmer’s home for hot soup and coffee. 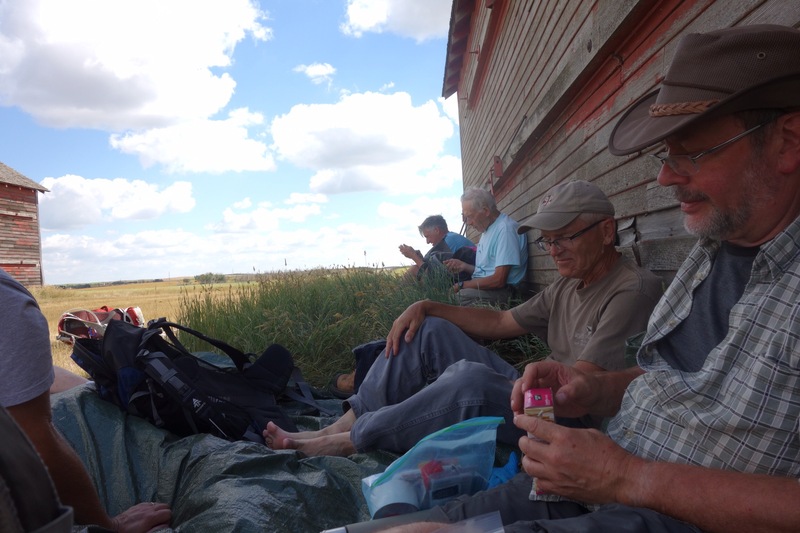 Several times farmers invited us in for muffins and coffee or cold water–so welcome on a hot day, when the water you’re carrying is, at best, lukewarm. When we stayed at Mosquito First Nation, the community provided us with supper and allowed us to stay inside their community centre because the weather forecast was calling for cold and winds too strong for tenting. The drivers of passing vehicles always waved, and sometimes they stopped to ask how we were doing and if we needed anything. 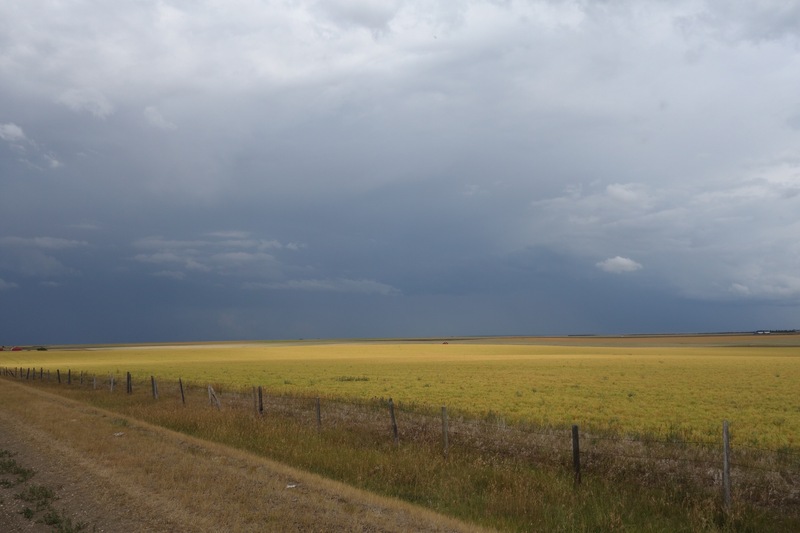 And many people we met shared stories with us, which helped me, as an outsider to rural Saskatchewan, to understand something about what it might be like to live there. We heard stories about ranching and farming, but also about what it’s like to live on a reserve and to be a residential school survivor. Those stories enriched our experience of the walk, especially the ones that were difficult to hear, and I’m so grateful to the people who shared them. 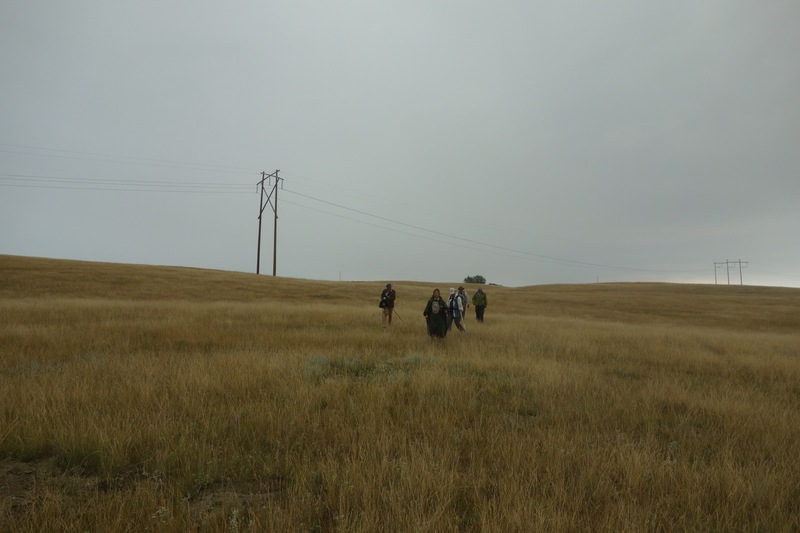 I’m going to keep thinking about this walk, about what I learned, about the community we created as we walked, about the landscape we walked through, about the kindness of the people we met. I learned a lot during the walk, but there’s still much I don’t know, much I don’t understand. 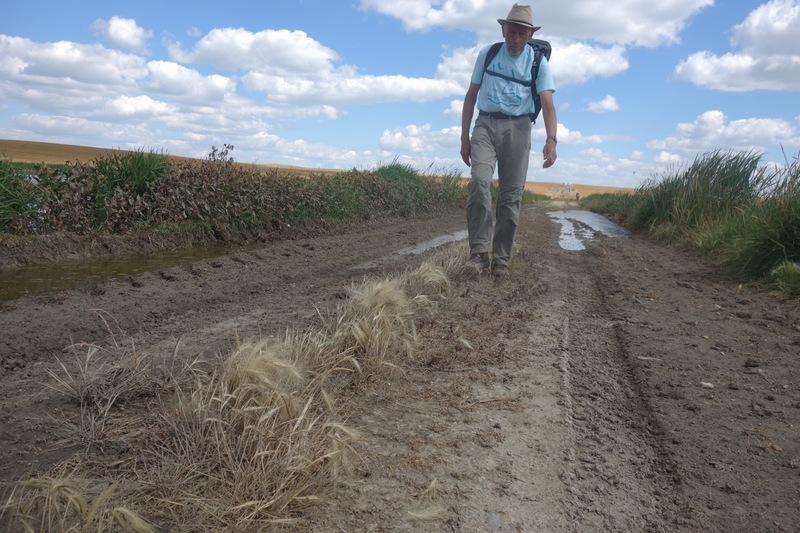 And I’m going to keep feeling grateful for the privilege of making this walk, for the people I met and the people I walked with, and for Hugh Henry’s work in making this pilgrimage possible. When you walk close to home, you begin to develop a deeper intimacy with a landscape you already know–if only slightly. It’s quite different from walking in Europe, for instance, where I find myself guessing at the names of plants and birds. Here, while I struggle to distinguish durum from barley at a distance, and I find myself wondering if the dominant grass in a patch of unbroken grassland is rough fescue or something else, and although I can’t distinguish birds by their song very well, I still feel a kinship to this place. At times that kinship is a burden, and at other times it’s a gift. I find myself being constantly reminded of the history of this place, a history that, as Candace Savage says in her book Geography of Blood, encompasses an ecocide (the destruction of the buffalo and much of the grassland that existed here before settlers arrived) and a genocide (the forced removal of Indigenous peoples from this place, their incarceration on reserves and in residential schools). People like me have benefitted from those events, because they’ve made it possible for us to live here in the style to which we’ve become accustomed. We might not be responsible for them–we are not our ancestors, after all–but because we’ve benefitted from them, we’re still answerable in some way. Exactly what that answerability might look like is something we’ve talked about after our morning smudges. 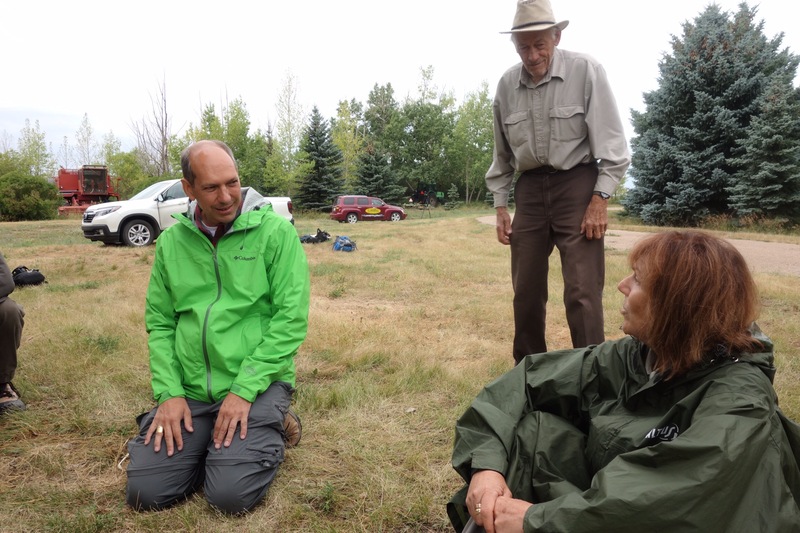 There’s some general agreement that feelings of shame and sadness aren’t productive, but still, when we stopped to look at a buffalo rubbing stone on our third day of walking, and as Rick made an offering of tobacco there, I felt overwhelmed by those emotions. It was the most powerful experience I’ve had on this walk. 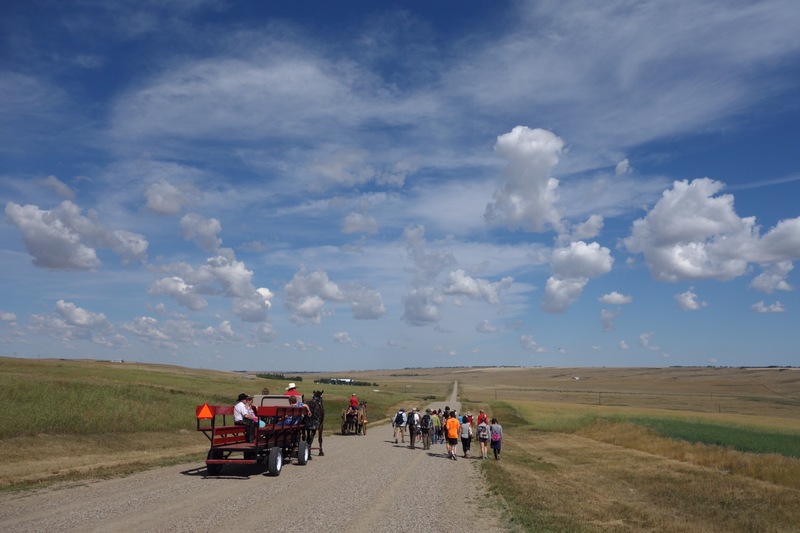 Our departure from Swift Current coincided with a Métis culture camp, and after words were spoken by representatives of groups that used the Swift Current to Battleford Trail–a Métis elder, an RCMP officer–a large group of people followed us to the edge of town. Then they turned around, leaving only the most foolhardy to continue walking north. Hugh had let a Hutterite colony know we were coming, and they invited us to have iced tea and cookies. It was a hot day and the cold tea was delicious. 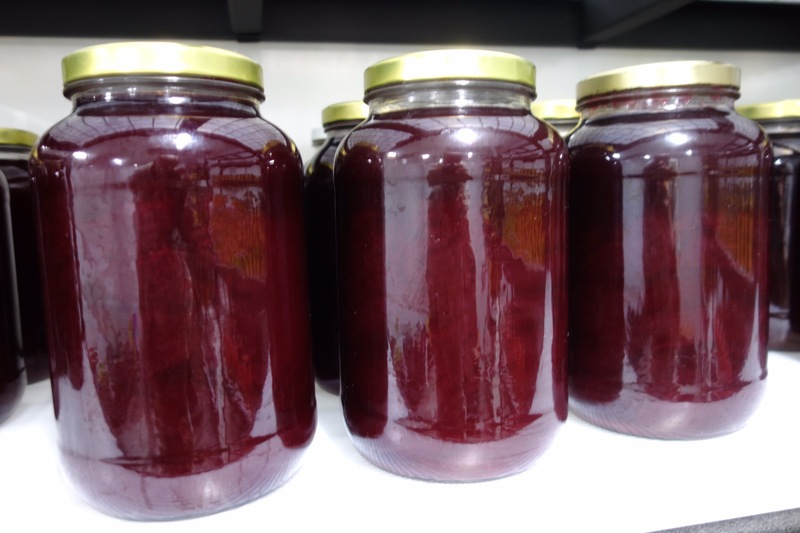 They showed us their preserves, too–each bottle a work of art. Then we spent the night in a farmyard, where we were served the most delicious chili I’ve ever eaten–and it wasn’t tasty only because of the day’s walk. The following night we spent in another farmyard. 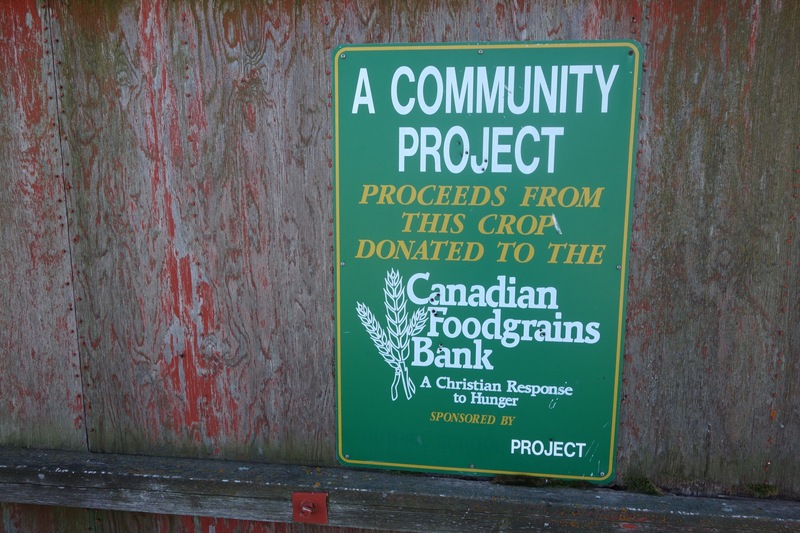 Gord, the farmer, told a story about his father’s experience of farming back in the 30s. “He shipped two cars full of lentils and got a bill for $17,” Gord said. That was the end of his father’s career as a farmer, but he was still drawn to that way of life, and made sure that his three sons each had a farm. In the morning we pushed on, across the South Saskatchewan River towards Kyle. 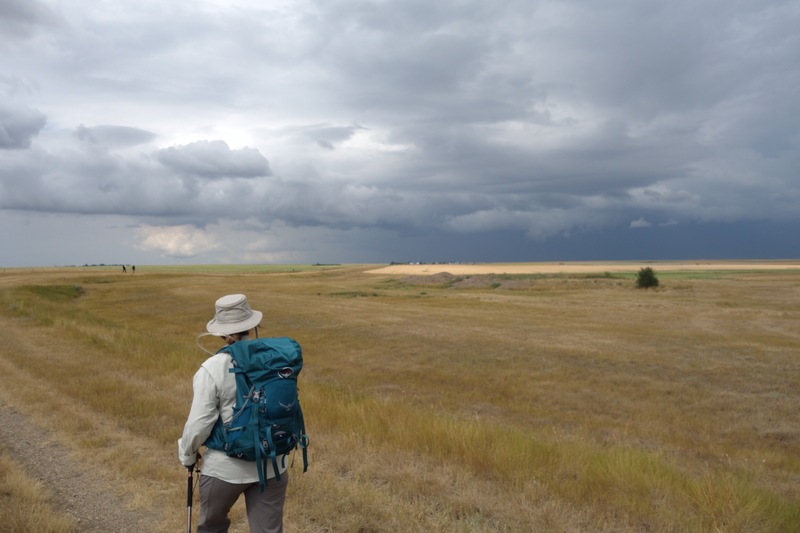 It rained a lot that day–and even though that makes walking inconvenient and uncomfortable, in a dry land like this one isn’t allowed to complain about rain–so we stayed in the hotel and treated ourselves to supper and breakfast there. I was particularly exhausted that second day, because I was carrying a heavy pack as a test to see if I could make a walk similar to this one alone, without support, at some future date, and I learned that at this point I’m not fit enough to carry 20 kilograms over 30 kilometres. I’d better make this walk, I thought, rather than treating it as a dry run for some future walk that may or may not ever happen, and in the morning I switched the heavier pack for a much lighter one. Much happiness has followed that decision. On the way out of Kyle, we met Amy, the proprietor of the Kyle Times, who warned us that the dessicants farmers spray on their fields of peas and lentils aren’t good to breathe. “There’s always drift,” she said, “and you’ll need to have something to cover your faces.” But so far we haven’t run across any dessicants being sprayed or any herbicide drift of any kind, although while we were looking at the petroglyphs today a cropdusting plane was buzzing back and forth on the horizon. We spent the night in Sanctuary, a ghost town that has metamorphosed into a large farmyard. Most of the buildings are gone. We made camp next to a lumber shed, one of the few remaining structures. Despite the drought this year, the nearby slough is in flood. 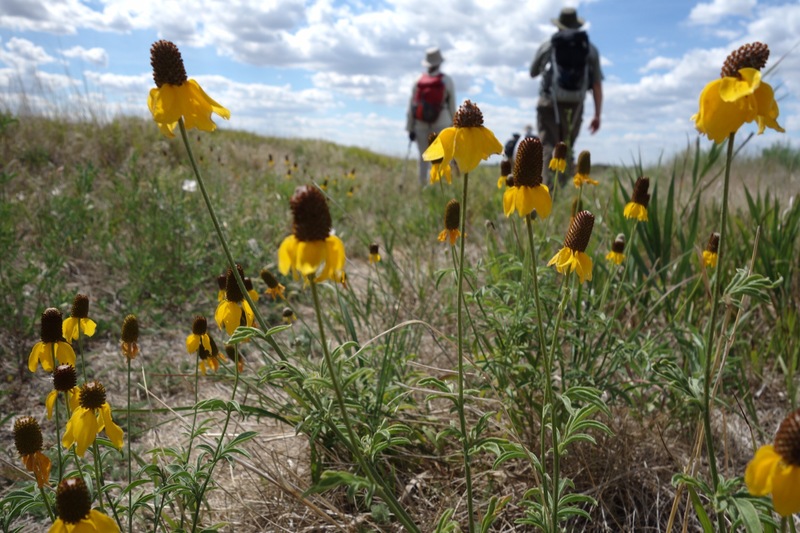 That’s been the case throughout this walk: the land is still working through the consequences of the past several wet years. We were scheduled to spend the following night in a farmyard at Otter Springs, one of the important stops on the Swift Current to Battleford Trail, but the weather forecast was calling for rain, so we stayed in nearby Elrose, where we had a communal meal of chili and rice and red wine. 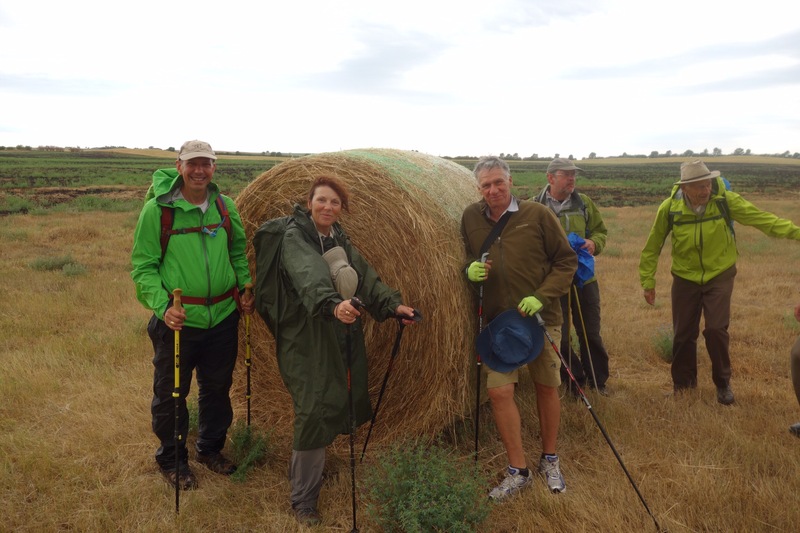 On the Camino, communal meals help to develop connections within the group, and the same was true for us in Elrose. That made a difference the following night, in Greenam, another ghost town, where we all slept on the floor of what had been the local school and is now a community hall. It’s a small room, and the chili was working its magic on everyone’s digestion. The farts and snores were easier to take now that we knew each other better–and besides, I was wearing earplugs. The next night, we slept in an abandoned farmyard known to the locals as Cappie’s Trees, after the family who homesteaded there in 1917. 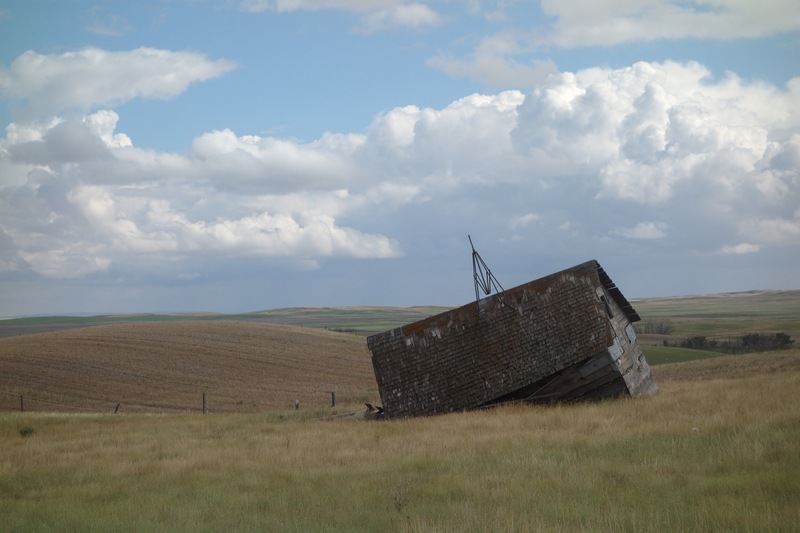 They’d abandoned the farm in 1937–a year many farmers finally gave up struggling against the drought and low prices–and the foundation of their home is still there. We’d walked across the Fairview Community Pasture to get there, and it had been a great if exhausting day of walking. Several local farmers and ranchers came by to say hello. 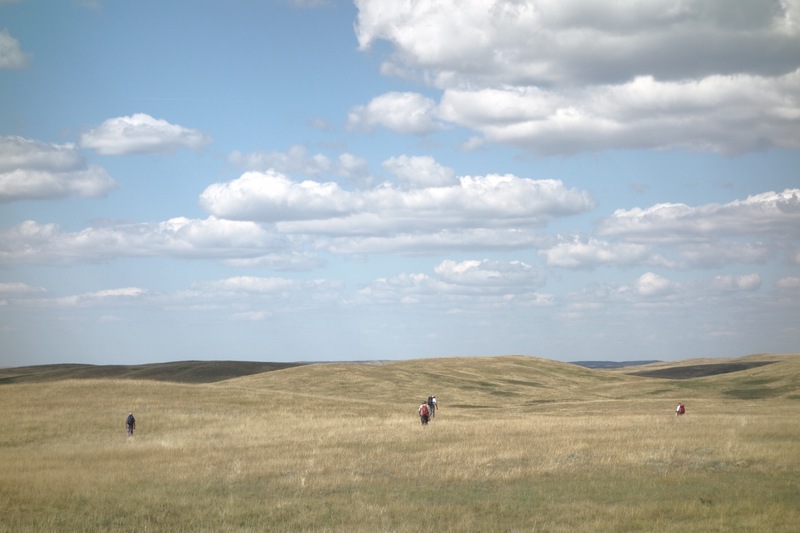 One was the grandson of the people who had lived there; another was a retired RCMP special constable, who walked with us for several miles the following day; and another was a local rancher who is part of the group who now leases Fairview from the provincial government. He told us that just an hour or so before we got there, a bull had been lost in the caraganas that sheltered us from the wind. They’d tried everything, he said, and they simply could not get him to cooperate and return to the herd. “We knew you folks were coming and we were getting a little worried, but eventually he went back to the cows by himself,” the rancher said. 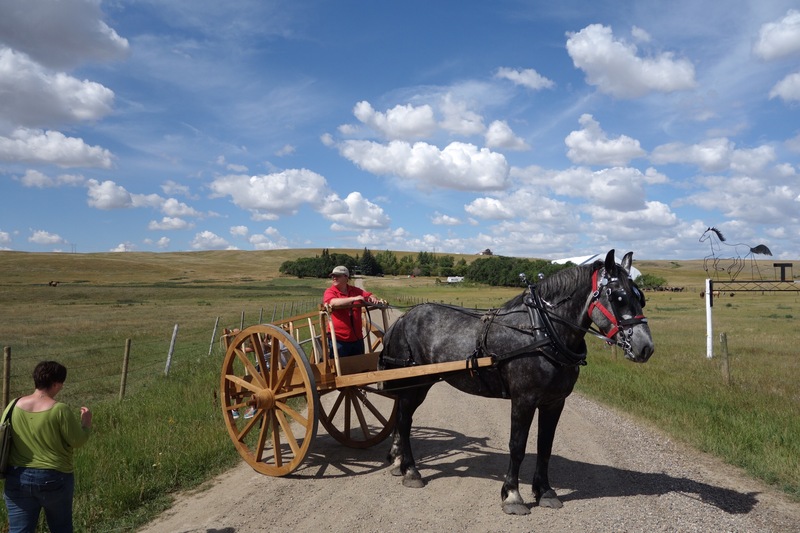 He told us about ranching and about the management of community pastures and the conflict between farmers, who till the land, and ranchers, who prefer to see it left as grass. 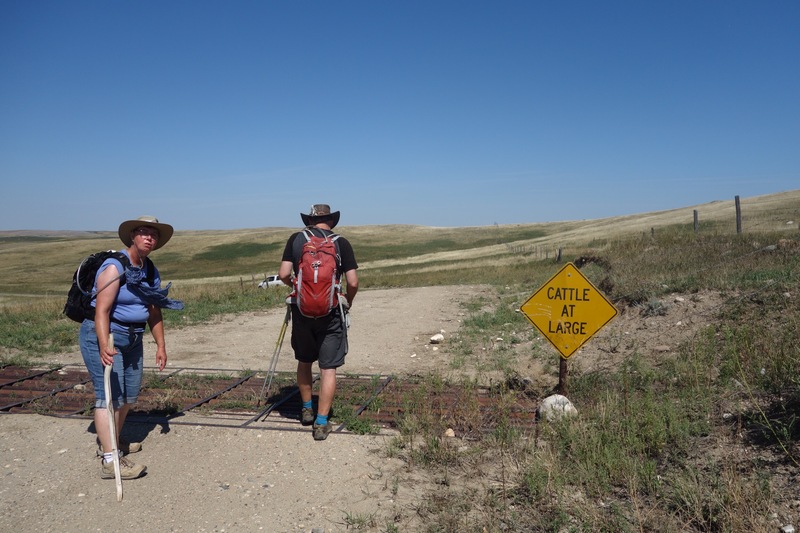 “This was pretty fair country until the farmers found it,” he told us, and thinking about our hike through the community pasture, across the Bad Hills, I found myself agreeing with him. The next morning, we headed for Fiske. Hugh was giving a talk at the community hall there that night, and we set up camp on the lawn outside. 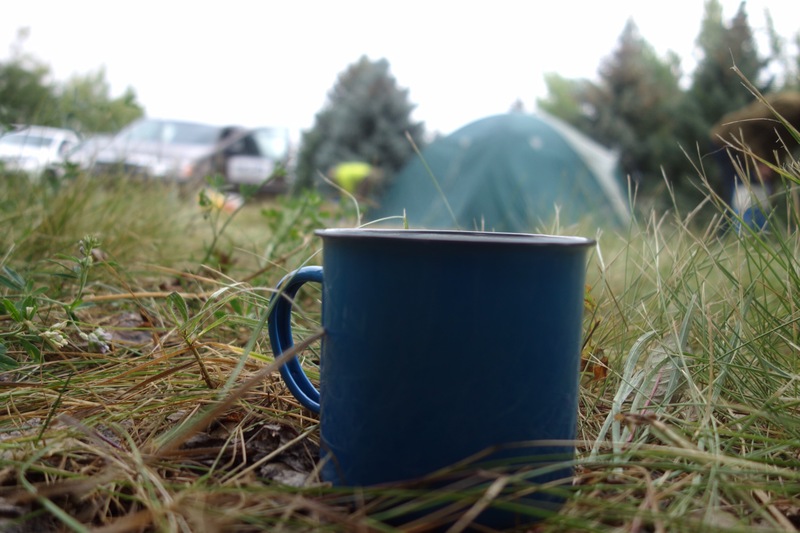 It was a good campsite: there was running water inside and a flush toilet, something I missed at Cappie’s Trees, where I found myself having to relieve my bowels the way most of the rest of the world does it. I felt a connection to the majority of humanity and broke through a psychological barrier, although I’m not keen to repeat the experience right away. There’s a bar in Fiske, and we ate dinner and breakfast there. Then we started walking to Herschel, where I’m typing this on a long table in a sunny room at the Retreat House. Tonight we’re having another communal supper–spaghetti and meatballs, I hear–and tomorrow we start walking north again. I’m glad we got this break, because I needed a rest, and there’s a huge, broken blister on the sole of my left foot that needs some attention, or at least a respite from walking. And I just heard someone say that there’s cold beer in the fridge. That seems like as good a reason as any to stop writing and find something else to do with the rest of my afternoon. The next time I get a chance, though, I’ll pull out my keyboard again and let you know how things are going. My intentions were to blog every day about this walk, but I hadn’t taken into account the amount of time it takes to set up camp and cook. I’d thought that it might be hard to find a cell signal, but that hasn’t been much of a problem. And the solar panel that’s attached to my pack has been doing a pretty good job of keeping my phone charged. 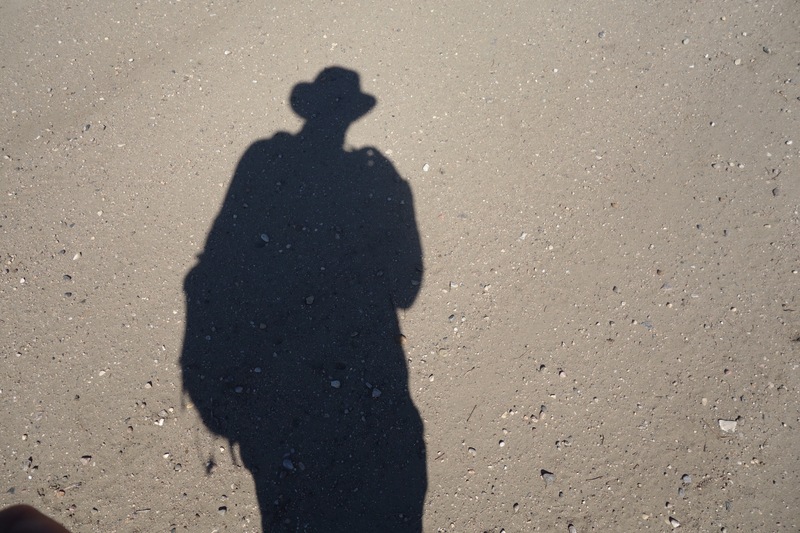 But aside from a few cryptic Facebook posts, I haven’t had much of a chance to share stories of this walk–until now. 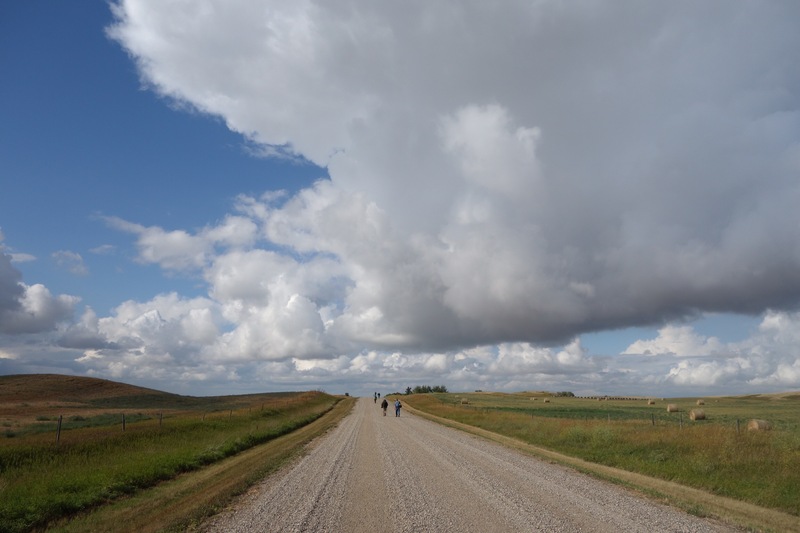 We have a rest day today, at the Herschel Retreat House, and assuming the cell signal here holds out, I’m going to pass along a few stories and photographs from the first half of the Swift Current to Battleford Trail walk. Yes, the first half. 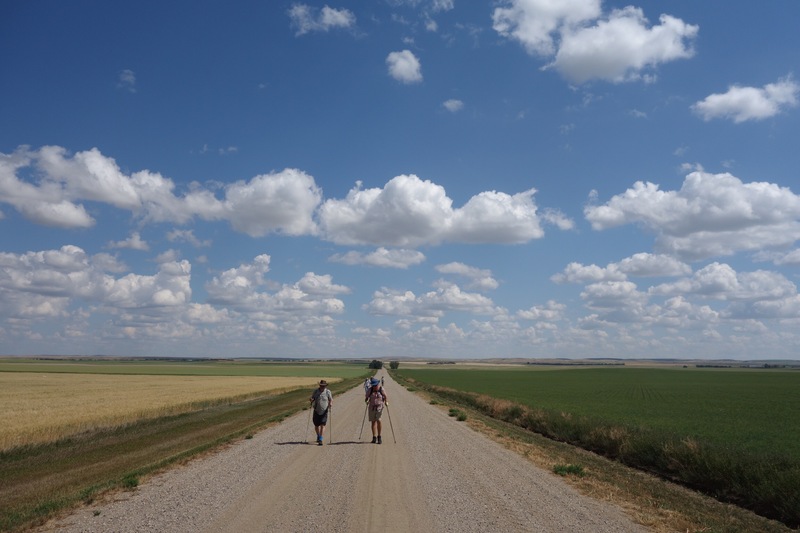 We’ve covered some 150 kilometres–and one of the interesting things about this walk is the way that those kinds of numbers become less important over time–and we have about the same distance left before we reach Fort Battleford on the 20th of August. In fact, we usually use Imperial measurements to assess how far we’ve walked, because that’s how the roads we walk along were surveyed back in the nineteenth century: a mile between roads running north-south, and two miles between roads running east-west, except when there’s only a road allowance, or when there’s some kind of obstacle, like a slough or a coulee. Occasionally we walk on roads that deviate from the grid, and that’s always a treat. And sometimes we walk across pastures or on road allowances. But mostly our path takes us along hard, stony grid roads. Who are “we”? Who is crazy enough to attempt this journey? 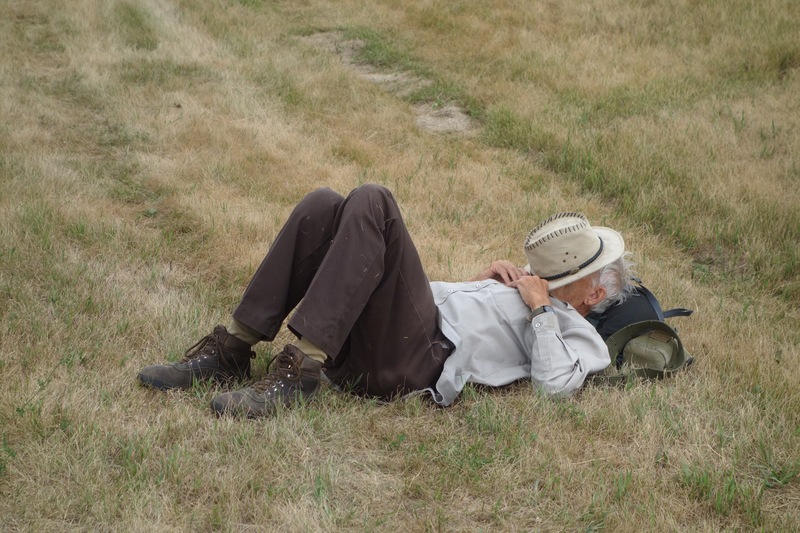 Well, Hugh Henry from the Saskatchewan History and Folklore Society is the primary organizer of this pilgrimage. 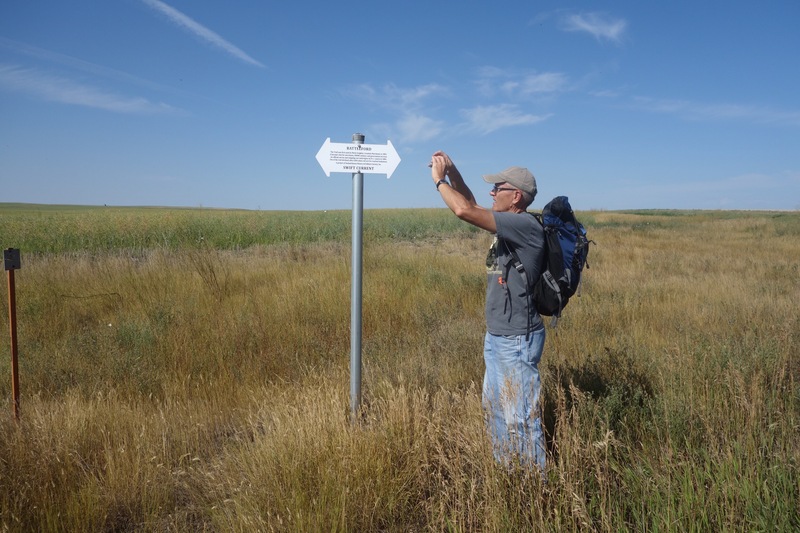 He’s been planning this journey for more than a year, researching the history of the Swift Current to Battleford Trail, figuring out where it ran and determining a route that follows its path as closely as possible–because most of the trail is now beneath cultivated fields. 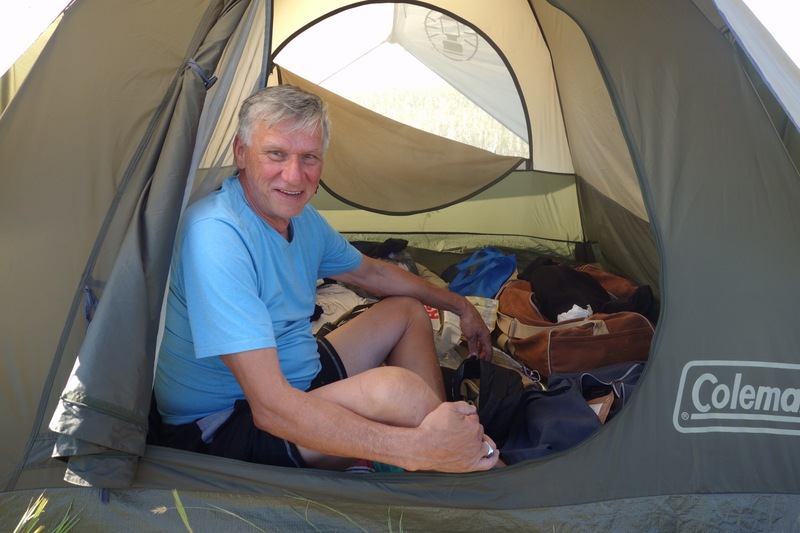 Hugh has also been talking to landowners about our trek, getting permission for us to camp in their farmyards. It’s been a tremendous amount of work and we’re very grateful to him, because without Hugh, there would be no walk. 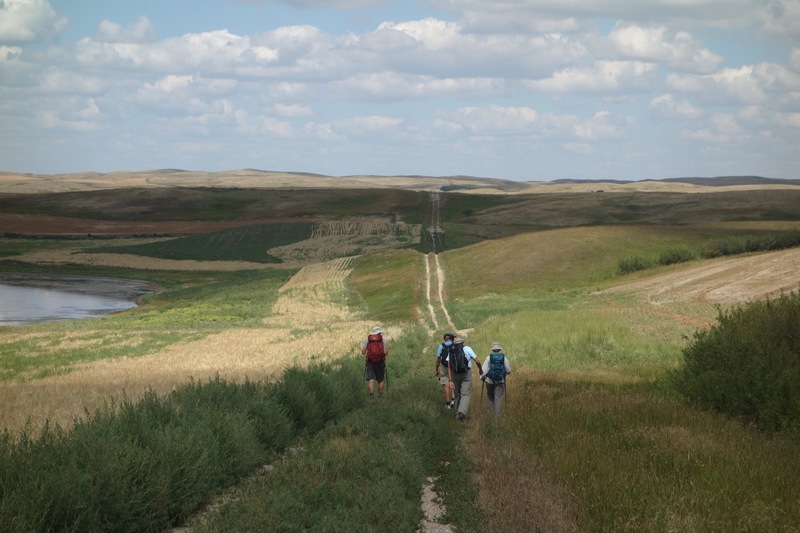 The other instigator of this journey is Matthew Anderson, who teaches courses on pilgrimage at Concordia University. 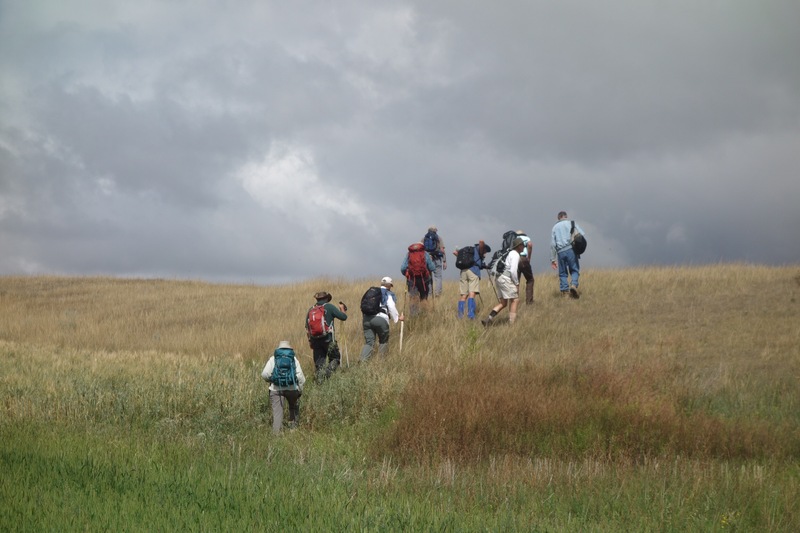 Hugh and Matthew organized a walk along the Wood Mountain-Cypress Hills Trail two years ago. I heard about that pilgrimage when it was happening, but at the time I was still a full-time student and couldn’t get away to walk with the group. When I heard about this walk, I was overjoyed, because after walking through the Haldimand Tract last year, I became very interested in the possibility of pilgrimages close to home, pilgrimages that don’t require a flight to Europe or Japan, pilgrimages through the territory where I live–in the case of this walk, Treaty Four and Treaty Six territories in southern Saskatchewan. I contacted Matthew, who put me in touch with Hugh, and I’ve looked forward to this experience for the last year. Matthew leads his students in a pilgrimage to Kahnawake, south of Montreal, every June, and some day I’d like to tag along on that walk. 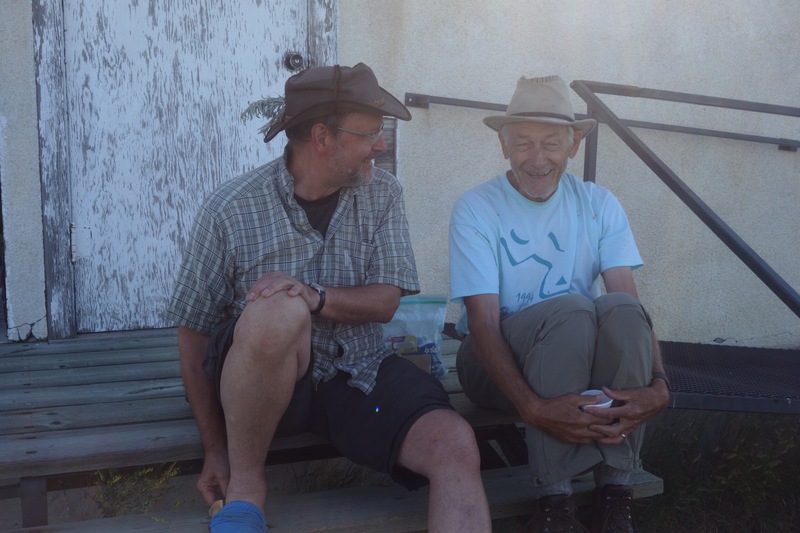 Harold and Rick walked the Wood Mountain to Cypress Hills pilgrimage in 2015, and they both decided to be part of the current walk. Rick is from Regina. He’s Métis and has led us in smudges and prayers every morning. Before beginning this walk, an elder told me to smudge every day, and Rick has made it possible for me to do that. Harold’s from Swift Current. He’s 81 years young. He would never accept this description of himself–he would wave it away with a dismissive gesture and say it wasn’t accurate– but we all admire his toughness and his wisdom and the speed at which he walks. I find it hard to keep up to him, and invariably he’s the first one to reach our destination. Both Rick and Harold end their walk here in Herschel, and we’re all going to miss them very much. 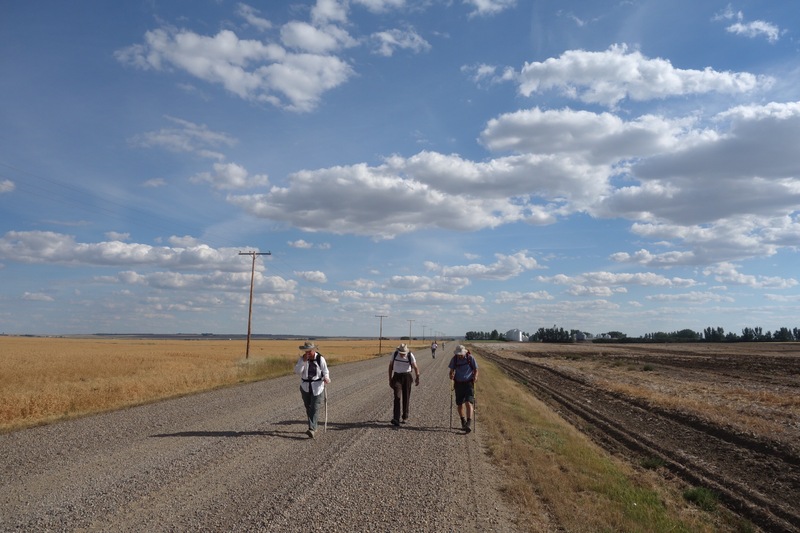 The other walkers who started out in Swift Current are Don, from Regina; Fred, from Waterloo, Ontario; Connie, from Frontier, Saskatchewan; my partner Christine, from Regina. We were mostly strangers to each other at the beginning of this walk, but we’ve formed a tight Camino family over the past week. Others have joined us at different times: Phil and Lorne and Kay. 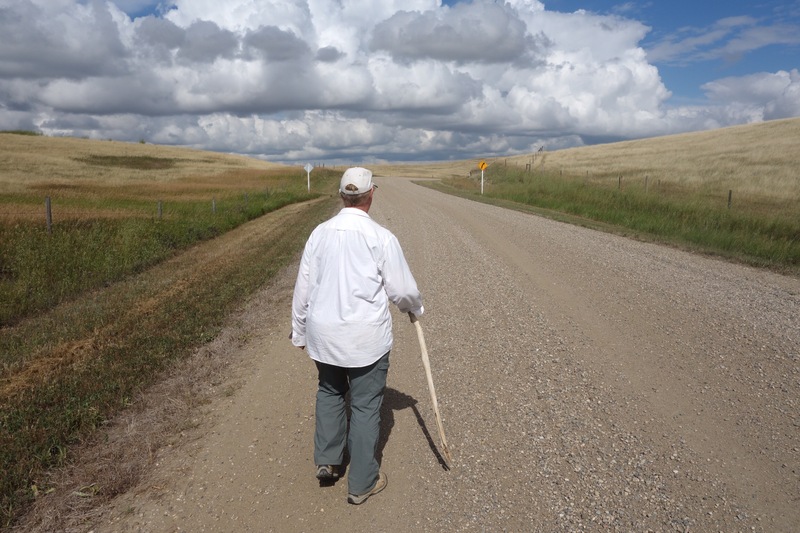 Lorne walked with us across the Bad Hills and the Fairview Community Pasture, and his partner, Linda, made dinner for us when we reached the community hall in Greenham, where we spent the night. And we’ve met with local people throughout this journey. Hugh has made presentations to audiences in Kyle and Fiske, and at Greenham we had an impromptu talk on the pilgrimage that Matthew, Harold, and Hugh made in Iceland last year. The interest people have shown in our quixotic trek has been gratifying: cold water or iced tea when we’re thirsty, waves, visits to our campsites. People have shared their knowledge with us and I’ve learned a great deal from them. Don has to return to Regina for a few days because of work commitments, but he intends to join us again further up the road. The rest of us will lace up our boots tomorrow morning and start walking again. We’re going to be taking a tour of a local archaeological site in a little bit, and I have to get ready. I’ll post more photographs of our pilgrimage this afternoon. In the mean time, here is a handful of images from yesterday’s walk. 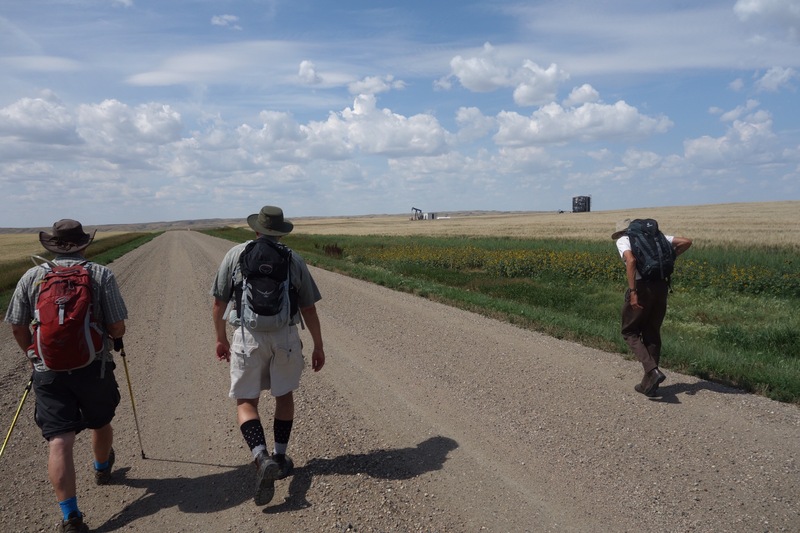 We leave today for Swift Current and the long walk to Battleford. Yesterday I had one last chance to walk with everything I’ll be carrying in my pack, and I took it. I had to visit the credit union, so I took a slightly different route from Sunday, and I walked the loop counterclockwise instead of clockwise. That meant I got to walk past the house in our neighbourhood where sunflowers seed themselves in the cracks of the sidewalk every year. Those sunflowers are one of my favourite things about this city. I walked north on Albert Street. After a while I turned west. I passed someone’s plastic raincoat, somehow caught high in an elm tree. I started to feel hungry, so I stopped at a convenience store and bought a little bag of peanuts. 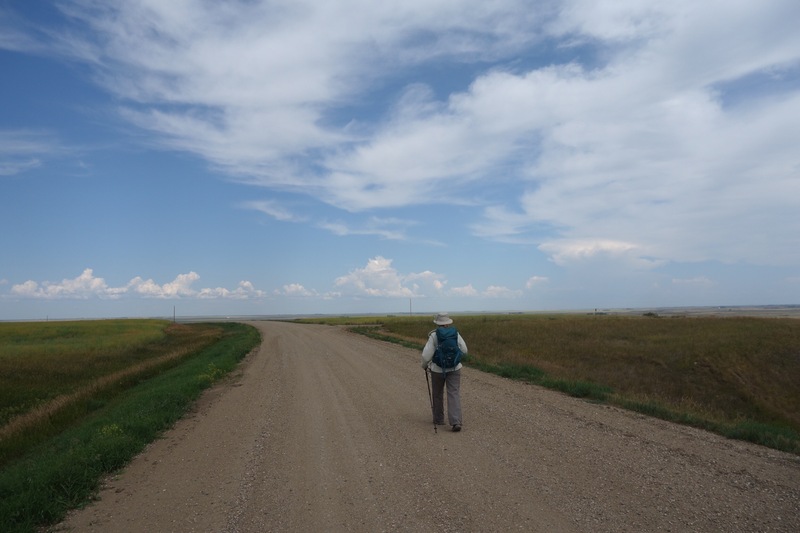 I thought about my current writing project and wondered what the Swift Current to Battleford Trail Walk is going to be like. Eventually I found myself on Rochdale Boulevard, where I ate lunch. After lunch, I headed back south. 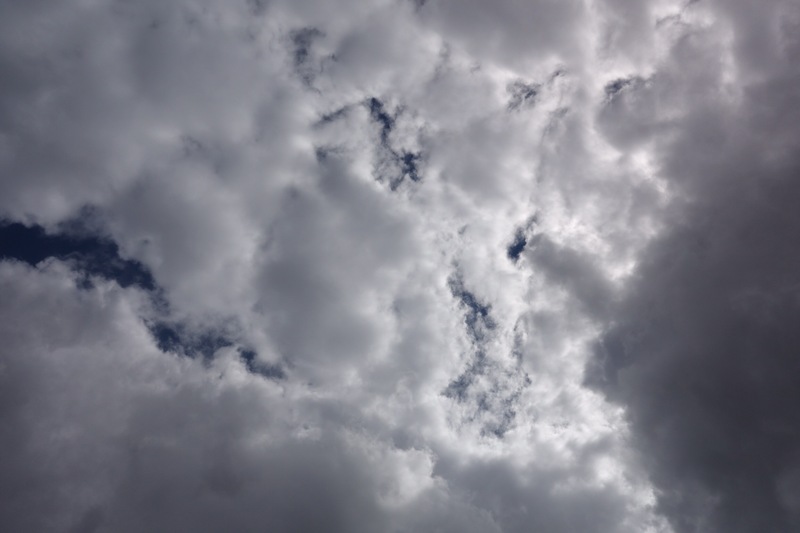 The clouds and occasional breeze promised some long-needed rain, but none fell while I was walking. I surprised three men resting in the shade of a sign announcing the project they were supposed to be working on. I saw joggers and cyclists and people walking their dogs, as usual. At one point a peloton of four bike cops on what must’ve been a training ride passed me. After six hours and 25 kilometres, I was home. A few weeks ago, a friend told me I must be very fit, what with all the walking I do. “Not really,” I replied, thinking about all the things I can’t do, like haul myself into the gym in the winter. But it looks like I might be fit enough for the walk that begins tomorrow. Fingers crossed.